Yvonne specializes in providing customized hair solutions for all types of hair. She receives constant and continuous education in the newest techniques and styles. 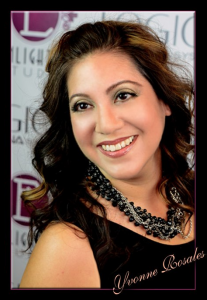 She is very passionate about the beauty industry and spends much of her down time practicing and researching new methodologies in all aspects of hair design, and color. Her clients reap the rewards of a masterfully skilled artist in color, cut, extensions & style. Yvonne is a true image artist who delivers amazing results! Her career started in 1996 in Tucson, AZ where Yvonne was born and raised. She understood that learning from those who came before her and have passion and excitement for the industry was the best way to start her career. She was a devoted assistant to many wonderful hairdressers at Gadabout, and while she loved the experience, lessons, and friends she made there, she knew it was time to spread her wings further. She took her career first to The Edge, a salon in North Tucson. Then moved to her uncle’s salon, Congress St. Hair located in downtown Tucson. This is where Yvonne was really able to develop her own style of hairdressing. Mentored by her uncle, a veteran in the industry, and the rich art culture in Downtown Tucson, she found inspiration and guidance. During her 8 years at Congress St. Hair Yvonne was proud to call U of A professors, attorneys, politicians, musicians, artists, business owners, and of course family and friends her clients. During this time frame Yvonne was introduced to the Logics/Matrix brand of professional products. She soon became certified with Matrix as an Artistic Educator, a title she still holds today. As an Artistic Educator Yvonne has the distinct pleasure of not only educating her fellow stylists through various forums, but also getting to work with and learn from icons in the hair industry. She is able to take this invaluable knowledge straight back to her clients. Moving to the Valley of the Sun was quite a transition for Yvonne. She was able to work all over the Valley, and then decided that Old Town Scottsdale was the place to make her dream come true. With the help of her husband and son Enlighten Studio finally came to life on May 4th 2010. Her team of stylists strive to live out Enlighten Studio’s mission every day and live by the platinum rule…Treat others how THEY want to be treated.